Because things in IT change fast, it’s sometimes difficult to distinguish the important trends from the less important. And that’s true for Oracle as well. It’s not that long ago when Oracle CEO Larry Elisson thought of Cloud Computing as just another short-living fashion trend (great audio by the way). But that began to change soon. And at least since Oracle OpenWorld 2015 we know for sure how serious Oracle became about Cloud Computing. Today, Oracle’s stack on the Cloud is complete. From infrastructure as a service (IaaS) to software as a service (SaaS) there is everything. But especially with all those wonderful SaaS products being available (and probably being used by your line of businesses) new challenges arise: How to keep all the data residing in those applications in sync? In other words: How to integrate those products? 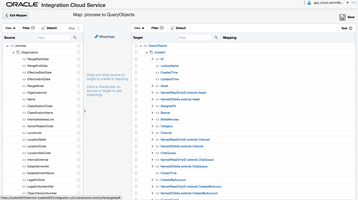 A neat way to address this is the Oracle Integration Cloud Service (ICS) which I would like to introduce to you in this blog post. Besides ICS I’m also going to mention two other integration services provided by Oracle namely SOA Suite Cloud Service (SSCS) and Process Cloud Service (PCS). Though for this blog post I won’t go into much detail there. The main reason to use Oracle ICS is to map and synchronize data between all different kinds of SaaS applications. For example, you might use Salesforce as your primary CRM application but another one for ERP activities such as order and invoice tracking. In such a case, if a new customer is created in Salesforce it should be created in the ERP application as well – automatically and immediately. The attentive reader might be wondering whether Oracle ICS is limited to cloud integrations. The answer is no. Hybrid integrations are supported as well but more on this later. Based on the main menu, functionality in ICS is organized into four main views: home page, designer portal, monitoring (dashboard) and administration. Before going into detail of monitoring functionality and administration, let’s have a look at the Designer. As you can see, the designer portal in turn is organized into five views: Integrations, Connections, Lookups, Packages and Agents. You might notice as well how clear and simple the UI appears. That clearly indicates the target audience of ICS: not only developers and IT but LOB users as well. Read the complete article here.